November 9, 2018. A team of Build Change coders were runners up in IBM’s global ‘Call for Code’ challenge and are profiled by the Silicon Valley podcast Technology for Good. October 27, 2018. IBM’s Developer blog sings the praises of Build Change’s PD3R team, which was the runner up in IBM’s 2018 ‘Call for Code’ challenge for their use of Artificial Intelligence in pursuit of structural integrity after disasters. October 3, 2018. The new Global Program for Resilient Housing will increase the global development on retrofitting existing substandard buildings to better withstand natural disasters, according to Civil + Structural Engineer. May 15, 2018.Each year, RMS sends a team to support Build Change efforts around the world, as Daily Mail & General Trust details in this press release. May 10, 2018. Joe Speicher, Executive Director of Autodesk Foundation, shares insights on Building Back Better after natural disasters. April 2018. (Spanish) Juan Caballero, Director of Programs and Alliances of Build Change in Latinamerica and with Juan Martínez, Autodesk Foundation Volunteer, spoke about Build Change’s mission in Colombia to prevent damages, economic losses, and tragedies caused by the collapse of homes and schools due to earthquakes and other natural disasters in vulnerable areas. April 24, 2018. (Spanish) Cities in Colombia have recognized the dangers posed by unsafe housing in the case of an earthquake. Build Change is working with the Autodesk Foundation and city officials to make housing safer before a disaster occurs. April 23, 2018. (Spanish) More than 10 million people live in unsafe housing in Colombia. Find out how we are working with Autodesk Foundation to make informal housing safer in this article. April 24, 2018. (Spanish) We are grateful to have been able to work with Autodesk Foundation and Team4Tech in Colombia. Read more about our week here. April 24, 2018. Thousands of homeowners demolished their damaged houses after the 2015 earthquake in Nepal when they could have saved them through retrofitting. Read more in this article featuring our Country Director in Nepal, Noll Tufani. April 19, 2018. (Spanish) Autodesk Foundation joined forces with our staff in Colombia in April 2018 to contribute to positive changes in the construction industry. April 17, 2018. Retrofitting is changing the reconstruction game in Nepal, and we are so proud to be a part of it. There are challenges, of course, but so much opportunity as well. March 12, 2018. How products and buildings are designed for climate change are addressed in this interview with Joe Speicher, Executive Director of the Autodesk Foundation, and Chad Frischmann from Project Drawdown. January 8, 2018. As the Carribean rebuilds after Hurricane Maria and Hurricane Irma, Build Change is proud of be supporting communities and governments in evaluating rebuilding techniques as mentioned in this article. December 20, 2017. Jeff Schlarb, a long-time friend of Build Change, hosted this interview with Elizabeth Hausler on his podcast. December 18, 2017. The Charity Edition of The Insurance Journal featured our partners at Risk Managment Solutions and their annual Trek to support Build Change programs. December 11, 2017. What would earthquake-proof cities look like? See examples of how Build Change and other initiatives are making this a reality in this article. November 12, 2017. The Innovate Podcast focuses on dialogue with international cultural leaders, social entrepreneurs, and leading scholars engaged in transformative action and creative collaboration. We are honored to have our Founder & CEO featured in this episode. October 25, 2017. “Operating in areas where building codes are often not enforced, Build Change has its own set of rules based on structural engineering analysis that can be adapted to each home.” Thanks to our partners at ANA Blue Wing for this article in Forbes! October 10, 2017. This article uses Build Change as an example of how social enterprises contribute to solving social problems. September 15, 2017. “Haiti: Mission Accomplished in Christ Roi” is a blog published by one of our partners, Solidarites International, about our project in the Christ Roi neighborhood of Port-au-Prince. September 7, 2017. Insurance-linked securities investors may soon influence the outcome of informal neighborhoods in South America due to Build Change’s retrofitting programs. Read more in this article in the Autumn issue of Insider Quarterly. August 17, 2017. Meet the first Simpson Strong-Tie Engineering Excellence Fellow, James Mwangi, in this blog by Simpson Strong-Tie. August 2017. Build Change projects in Haiti are featured in this edition of Challenges Magazine. July 2017. Dr. Elizabeth Hausler was featured on the cover of Change Creator Magazine, focusing on social innovation and the story that led up to her accepting a 2017 Skoll Award on behalf of Build Change. July 25, 2017. “It is time for resilience to become part of the definition of “decent, affordable, and safe housing.”’ This article by Luis Triveno on the World Bank Sustainable Cities blog, co-authored by our Founder & CEO and other experts in the field, urges people to look at substandard housing as a “life-or-death” emergency. June 20, 2017. “Cities Taking Action: How the 100RC Network is Building Urban Resilience” focuses on how the 100 Resilient Cities network of organizations, cities, and supporters are making cities safer around the world. June 7, 2017. As a part of the World Bank Cities Sustainable Communities blog series, Elizabeth Hausler & Luis Triveno look to retrofitting as a housing policy that could almost pay for itself. May 17, 2017. The new Simpson Strong-Tie Engineering Excellence Fellowship was launched in May. May 10, 2017. (Original text in Nepali). Surakshit Ghar, a mobile application developed by Build Change for the Nepal National Reconstruction Authority (NRA) has been officially launched. May 10, 2017. (Original text in Nepali) Your mobile phones will now be useful for building safer houses. The National Reconstruction Authority (NRA) has introduced Surakshit Ghar app in order to build earthquake resistant safer houses. May 10, 2017. The Kathmandu Post published this article following a press conference announcing the release of the Surakshit Ghar app, developed by the Build Change team in Nepal to support homeowners in safe reconstruction. May 10, 2017. Abhiyan Daily published an article on the release of Surakshit Ghar app. NRA had officially launched the app developed through the support of Build Change by organizing a press conference on Tuesday. May 10, 2017. The earthquake affected citizens of Nepal can now get information on safe reconstruction through a mobile app. The mobile app has been developed by Build Change for Nepal. May 10, 2017. Surakshit Ghar, a mobile application developed by Build Change for the Nepal National Reconstruction Authority (NRA) has been officially launched. May 9, 2017. The National Reconstruction Authority (NRA) has launched a mobile application ‘Surakshit Ghar’ to support reconstruction in Nepal. The app was developed by Build Change’s team in Nepal. May 4, 2017. “The resulting peace of mind extends well beyond the value of sturdy, reinforced walls,” details this article in the Wall Street Journal. April 28, 2017. Humanosphere interviewed Elizabeth Hausler in this podcast about how she came to found Build Change, and how Build Change works with communities around the world to protect homes from disaster. April 20, 2017. Cadalyst interviewed Build Change staff about our unique approach to using drones in Nepal, and our work sponsored by Lenovo. April 7, 2017. This article details how Build Change works alongside homeowners, builders, and our other partners to create permanent change in the construction industry. April 6, 2017. The Manila Standard’s article on Makati City and their earthquake guidelines mentioned Build Change and our partnership with Makati City to retrofit homes to prevent collapse. April 6, 2017. Listen in to the Social Design Insights Podcast episode “Build Change – A Homeowner-Driven Approach to Rebuilding After Disaster” with Elizabeth Hausler. April 4, 2017. This article by Thomson Reuters Foundation details Elizabeth Hausler’s experience as a young bricklayer, and how that ultimately led her to founding Build Change. March 27, 2017. “As a Ph.D. candidate in civil engineering at the University of California, Berkeley, Hausler wrote her dissertation on liquefaction,” this article by B Magazine details. Read more about how Build Change was founded, and what led to our selection as one of the 2017 Awardees for the Skoll Awards. March 27, 2017. Build Change was featured in The Denver Post as a part of the announcement that Elizabeth Hausler and our organization won a 2017 Skoll Award for Social Entrepreneurship. March 25, 2017. Kate Landry was featured in this article about our partnership with the ARISE networks in the Philippines. March 2017. Our retrofitting program and engineering team in Bogota, Columbia was featured by local news station, City TV. March 9, 2017. Our retrofitting project in the City of Makati, in Metro Manila, is featured in this article on the dangers posed by the fault line running through the area. November 10, 2016. Our drone project in Nepal and retrofitting program in Colombia are featured in this article in See Change Magazine. November 9, 2016. (Spanish) This article focuses on the importance of retrofitting before the next disaster in Colombia, and how Build Change is working alongside local government to retrofit at-risk houses in the country. November 7, 2016. The Huffington Post authored this article for Glocal Khabar on “7 Social Innovators Accelerating Change in Nepal”. Our staff member Kuldeep Aryal was featured as one of these innovators. November 2, 2016. Fast Company’s Design section published this article focused on resiliency to disasters, and specifically on IDEO.org’s efforts to support this cause. Our program in informal settlements in Metro Manila, Philippines is one of the projects featured. September 22, 2016. This Indonesian newspaper featured our Better Building Materials program in Padang, West Sumatera. July 2016. Claims Management Magazine featured this interview with Build Change Board member Grace Hanson. July 14, 2016. (Spanish) The Colombian newspaper La República published this interview with Juan Caballero, in which he details the importance of public- and private-sector involvement in retrofitting cities. June 25, 2016. (French) Les echos du Nord in Gabon participated in Impact Journalism Day 2016 and featured this article on Build Change. June 25, 2016. (French) L’Actu / Mon Quotidien published this article in France for Impact Journalism Day 2016. June 25, 2016. (French) For Impact Journalism Day, the Swiss paper La Tribune de Genève published this article about Build Change programs. June 25, 2016. (French) For Impact Journalism Day, El Heraldo published this article in French about Build Change programs. June 25, 2016. The Straits Times featured this article on our work in the Philippines after Typhoon Haiyan in 2013 as a part of Impact Journalism Day 2016. June 25, 2016. (French) The Belgian newspaper Le Soir featured this article on Build Change as a part of Impact Journalism Day 2016. June 25, 2016. The Philippine Star highlighted our program in the Philippines as a part of Impact Journalism Day 2016. June 25, 2016. (French) L’Express of Madagascar shared Build Change’s story as a part of Impact Journalism Day 2016. June 21, 2016. Solidsmack featured Build Change and our partnership with Lenovo in this piece on our methods for changing how reconstruction takes place. June 6, 2016. (Spanish) El Espectador interviewed Juan Caballero regarding the challenges faced and solutions implemented by our retrofitting program in Bogotá. April 30, 2016. El Tiempo published this article (originally in Spanish) about Juan Caballero and Ricardo Ramirez’s presentation on the Colombian Seismic Retrofitting Manual in Bogotá. April 21, 2016. Community theater is a long-standing tradition in Nepal, which Build Change leverages to spread word about safe reconstruction techniques. This program is featured in World Vision’s article “Harnessing Theater to Build Change” by Aaron Aspi. April 6, 2016. Build Change is featured in “The rural resilience challenge – poor construction quality a key factor behind high casualties” by Helen Roeth at CSR Asia. March 8, 2016. Build Change is featured in the article “Why Women are the Architects of Our Sustainable Future” in Eco-Business, highlighting how women and girls are more vulnerable to the impacts of climate change. February 1, 2016.Jennifer Pazdon, an engineer who has worked with Build Change in Nepal, Indonesia, and now the Philippines, describes how we “address challenges to design and construction of disaster-resistant homes and schools in emerging nations” in this article published in Civil & Structural Engineer Magazine. January 11, 2016. Elizabeth Hausler speaks to Build Change’s open-source methodology to support the spread of safe building techniques. “Build Change’s design and safe construction guidelines are now used by dozens of other NGOs and have been adopted by seven major relief agencies” writes Katherine Milligan in this article. December 18, 2015.Elizabeth describes “working with governments from the start, right after a disaster, to change the way they approach the reconstruction” in this article published by the World Economic Forum in conjunction with the Schwab Foundation’s Social Entrepreneurs program. November 5, 2015. “The municipalities of Bogota and Medellin, for example, have allocated funds for retrofitting, or strengthening, homes in neighborhoods prioritized for this type of intervention,” details this article from Swiss Re Foundation. November 2015. “Everyone has the right to a safe house, regardless of income,” says Elizabeth Hausler in this Up Close feature in the American Society for Engineering Education’s monthly PRISM publication. October 30, 2015.Build Change’s report on Nepal is cited in this article by Next City, proving “better brickwork, steel reinforcement and other modern techniques helped buildings withstand the quake”. October 19, 2015. “Up to 60 % of all urban plots in Colombia have an informal building on them. The chances are very high that this building would not withstand a large earthquake.,” Elizabeth Hausler says in this entry on the World Economic Forum’s blog. October 7, 2015. “The key to strengthening buildings so they can withstand high winds and ground shifts lies in confined masonry (reinforced concrete to tie together load-bearing walls),” Elizabeth Hausler says in this article with Autodesk’s Line/Shape/Space publication. September 14, 2015. ” Following the 2003 earthquake in Bam, Iran, Elizabeth saw reports that most of the 26,000 deaths were caused by collapse of unreinforced masonry and mud brick homes” says Huffington Post in this blog entry about Echoing Green and Build Change. “I look at housing as a basic human right — everyone has the right to a safe house that can protect them from natural disasters [including] earthquakes, typhoons, and wind storms,” Elizabeth Hausler says in an interview with Grist. After a devastating earthquake, some innovative urban development work is going on in Port-au-Prince. Architect Anna Calogero explains the Build Change model, which focuses on bringing together money, technology, and people to create permanent change in construction practices, in Doggerel, the online magazine of Arup in the Americas. Housing Forum held in Kalibo, Aklan, Philippines, on May 21 and 22, 2015, attended by Kate Landry, Philippines Director of Partnerships and Programs. Ulina Shakya is a University of Arizona graduate student studying civil and engineering mechanics and is in Nepal as an intern with Build Change. Elizabeth Hausler discusses the engineering behind earthquake-resistant building. Elizabeth Hausler, Founder and CEO, about the challenges that Nepal faces following the earthquake and the ways in which the private sector can prevent such large-scale damage in the future. May 1, 2015. “We want to look at the post-disaster environment as an opportunity not only to build safe houses, but to create change, as it’s likely that the region is going to experience similar disasters in the future,” says Elizabeth Hausler in this article Rebuilding After Tragedy. Build Change is mentioned in this interview of Dr. Pennington. Elizabeth Hausler, Founder and CEO, wrote about the impact of the private sector on disaster-resistant buildings, on the World Economic Forum blog. Noll Tufani, Country Director in Haiti, explains why Build Change focuses on retrofitting in Port-au-Prince. Elizabeth Hausler discusses Build Change and its emphasis on empowering women and encouraging women engineers. Read the article. The Autodesk Technology Impact Program donates software to nonprofits that use design to solve epic challenges. Build Change was a recipient of this generous grant. Aurora Alemendral interviews Gordon Goodell, Build Change’s chief operating officer, about rebuilding in the Philippines, for The Rockefeller Foundation’s 100 Resilient Cities blog. Learn more here. Sogesol is helping rebuild Haiti by joining Build Change to launch a new microfinance program, called, ‘Bèlkay Kredi’. Learn more here. Elizabeth Hausler writes about the opportunities to build back better in post-disaster situations. Available here. Build Change is noted as an example of a nonprofit which is reinventing existing patterns to create long-term change. Available here. Dr. Hausler’s post on disaster risk reduction is translated and featured on the Banco Interamericano de Desarrollo website. Click here to read the blog (in Spanish). Build Change is interviewed about reconstruction in post-disaster situations. Read and listen to the story here. Build Change is selected as a Semi-Finalist for the 2013 Buckminster Fuller Challenge. Established in 2007, the Buckminster Fuller Challenge aims to support the development and implementation of solutions with significant potential to solve the world’s most pressing problems in the shortest possible time while enhancing the Earth’s ecological integrity. Read more. Build Change held a “Better Building Materials” community event in the Nagari Pasie Alung Lubuk Laweh District in West Sumatra, Indonesia, to determine which brick manufacturer produced the strongest bricks in the area. Lakay Weekly reports on the press conference held by Build Change and J/P HRO on June 3, 2013, in Port-au-Prince, Haiti. The organizations showcased their progress and explained their mission to the press and to the public. Read the story. Build Change and J/P HRO work in partnership with homeowners and builders to build earthquake-resistant houses and create jobs in Delmas 32. Click here to learn more. Build Change and J/P HRO work in partnership with homeowners and builders to build earthquake-resistant houses and create jobs in Delmas 32. Read the article here (in French). Degenkolb Engineers and Build Change won the Award of Excellence for our Haiti Seismic Evaluation and Retrofit Guidelines. This award is for outstanding achievement in the development of structural engineering practice and concepts through the analysis, design, evaluation and/or testing of structures resulting in the preparation of a study, research project, guideline or reference standard. Click here to learn more. Dr. Elizabeth Hausler’s blog on disaster risk reduction is featured on The World Economic Forum’s blog. Read it here. April 25, 2013. A live interview with Dr. Elizabeth Hausler Strand at the World Economic Forum on Latin America. Hans Rothgiesser from Semana Económica interviews Dr. Elizabeth Hausler at the World Economic Forum on Latin America, held in Lima, Peru. Watch the interview. Dr. Hausler’s blog on disaster risk reduction is featured on The Huffington Post website. Click here to read the blog. This article (in French) mentions how Build Change supported Panos Caribbean by training journalists in construction messages and participating in a large community meeting about safe construction practices. Read the article. This article (in Bahasa Indonesia) features the work Build Change does to help brickmakers near Padang, West Sumatra, produce better building materials. Click here to read the story. This article features the February Build Change Indonesia Grand Opening event in Bandung, West Java. It also highlights the work Build Change is doing to train others about earthquake-resistant design and construction. Click here to read the article. For International Women’s Day, Kiva discusses why women make great social entrepreneurs and showcases four women entrepreneurs impacting the world, including Build Change CEO and Founder Elizabeth Hausler. Read more. Elizabeth Hausler is featured as one of four women social entrepreneurs who are impacting the world and making a difference. Click here to read the article. 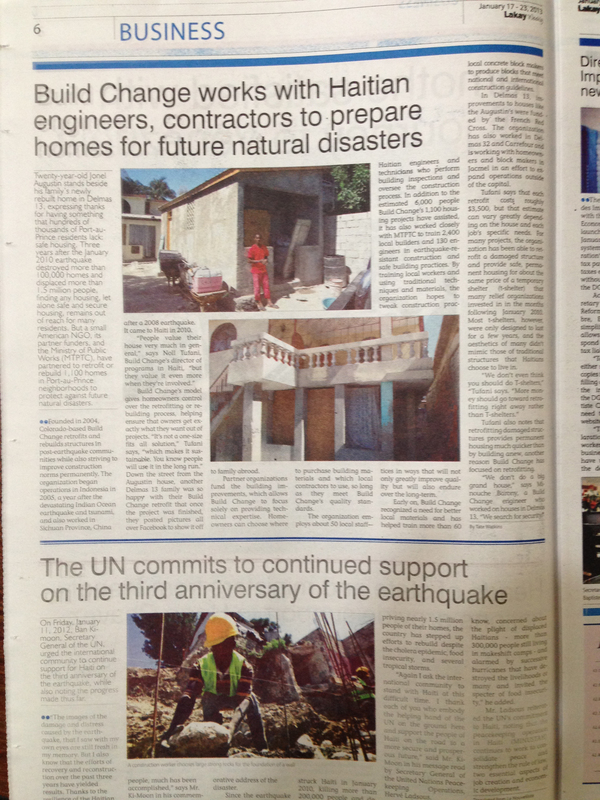 Lakay Weekly discusses how Build Change has worked with homeowners, Haiti’s Ministry of Public Works and partner organizations and provided technical assistance to help families in Haiti retrofit or build new 1,100 earthquake-resistant homes. The article also highlights the benefits of retrofitting houses versus building temporary shelters after a disaster. View the full story. Built Expressions, a civil engineering and architecture magazine based in India, features Dr. Elizabeth Hausler and Build Change’s homeowner-driven approach to post-disaster reconstruction. View the full story. Build Change’s vocational student training program is featured in the Indonesian newspaper Radar Kepahiyang. Read the story (in Indonesian). Tate Watkins interviews Dr. Elizabeth Hausler for this article about the founding of Build Change and how its work has changed earthquake-resistant construction in Haiti. Build Change is selected as one of 12 finalists in the 2012 World Habitat Awards for the organization’s post-earthquake reconstruction efforts in Indonesia. View the announcement. Build Change’s Gordon Goodell and Kathleen Jeanty are featured by KSL TV in Salt Lake City Utah. Watch the segment. Elizabeth Hausler is featured on the Echoing Green website as part of the site’s blog series Unleashing your talent to solve the world’s biggest problems. Click here to view the full story. Elizabeth Hausler and several other social entrepreneurs using good design to solve significant global issues are interviewed for this article. The University of Colorado Denver’s On the Horizon alumni newsletter mentions Dr. Hausler as the recipient of the Schwab Foundation’s 2011 Social Entrepreneur of the Year Award. Click here to see the article. This e-book distills the best practices and accomplishments of Build Change and other social enterprises from posts published on Next Billion in collaboration with Ashoka in Q4 2011 under The BIG IDEA series on affordable housing. This e-book is a resource for practitioners and colleagues working in this sector. Access the publication here. Dr. Hausler is interviewed by David Pelcyger of PBS Newshour Online: View the full story. Dr. Hausler is featured in the You’ve Got Skills section of the March 2nd issue of Time for Kids. View the article here. Build Change is featured as a “Success Story” in Universal Giving’s membership newsletter PhilanthroBuzz. View the article. HousingRevolution features Build Change’s low cost improvements construction methods. View the article. December 21, 2011. “Building Change One Brick at a Time in Haiti, China and Indonesia” by Lee Schneider. Huffington Post features Dr. Hausler and describes how Build Change is saving lives in Haiti, China and Indonesia. View the article. November 23, 2011. “Building Knowledge, Not Just Houses, in the Developing World” by John Tozzi. Businessweek Magazine examines how Build Change is helping Haiti build back smarter by training local builders and engineers. View the article. November 2011. EERI Newsletter, November 2011, Volume 45, Number 11. The partnership between Build Change and Degenkolb is featured. View the article here. A profile of Build Change is featured on the Hilti Foundation website, including information and pictures of our Haiti and Indonesia programs. October 31, 2011. “Housing Series: Building a Strong Foundation, When Earthquake Hurricanes Hit Affordable Housing” by Rochelle Beck. Next Billion launched a month-long series on Housing for All in partnership with Ashoka and featured Build Change. Read the article here. September 2011. “People working with Build Change and other organizations train the local engineers to perform [building] evaluations” says Mark Sinclair in this article about home-owner driven retrofits in Haiti. Schwab Foundation announces Dr. Hausler of Build Change as one of the 2011 US Social Entrepreneurs of the Year. This article features Build Change and partner organization Architecture for Humanity. Build Change is featured on the site ProFellow.com, a website dedicated to showcasing Fellowship Winners like Dr. Hausler. Read the article here. Build Change’s Founder & CEO, Dr. Elizabeth Hausler, is selected as one of the recipients of the ELLE Magazine 2011 9 For All Mankind award. Read more. June 2011. Dr. Hausler presents at the 2011 Eureka Fest and accepts the award for 2011 US Social Entrepreneur of the year. Watch here. The Cement Trust blog features Build Change’s work in Haiti. Read the blog here. SciDevNet discusses the importance of the homeowner-driven reconstruction model used by Build Change in Indonesia. Read the article. A discussion of the Three Cs of Build Change. Read more. John Roach articulates the importance of the three Cs and homeowner empowerment in the work of Build Change. Read the article. A feature on Dr. Hausler, recipient of the 2011 Lemelson-MIT Award for Sustainability. Read more here. New Scientist interviews Elizabeth Hausler. Read the article. Science360.gov features Elizabeth Hausler’s Lemelson-MIT profile video. Watch here. The online magazine, Business Wire, features Dr. Elizabeth Hausler, winner of the 2011 Lemelson-MIT Award for Sustainability. Read the article. iStockAnalyst features Dr. Elizabeth Hausler, winner of the 2011 Lemelson-MIT Award for Sustainability. May 5, 2011. Social Entrepreneur and Build Change Founder Honored for Sustainable Earthquake-Resistant Housing Innovations. Watch the video. The Hilti Foundation features Dr. Hausler with a brief history of Build Change. Read the article. News on the partnership between San Francisco based Forell/Elsesser and Build Change. Read the article. Mauve Conran interviewed Elizabeth Hausler after the January 19th Pakistan Earthquake. How Build Change is shaking up construction practices in earthquake-prone areas. Read the article. An essay by Dr. Hausler on the Build Change homeowner-driven model in Haiti is featured in the Innovations Journal, published by MIT press and the Clinton Global Initiative. Read the essay. A feature about Build Change’s involvement with the Clinton Global Initiative. Read more. A video produced by CH2M Hill about the January 2010 earthquake in Haiti and how Build Change is helping to train homeowners, builders and engineers to rebuild earthquake-resistant houses. View the video. A case study featuring a tough decision for the Build Change Indonesia program. Following Build Change’s work in West Sumatra. Read the article. Bruce Sterling writes about Build Change’s work in West Sumatra. Read more. Build Change is featured in this documentary about the May 12, 2008 earthquake in Sichuan, China. The China Quake! DVD is available for purchase here. World Vision Report profiles Build Change’s technical assistance programs in West Sumatra, Indonesia. Read more. The bottom-up method is best for rebuilding after disasters. Read more. The Jakarta Globe features Build Change after a fundraising event for safe reconstruction after the Padang Earthquake. Read more. Learning is the key to development. Download the publication here. Build Change’s founder and UC Berkeley graduate, Dr. Elizabeth Hausler, is featured in the Spring Issue. Read it here. The BBC quotes Build Change’s founder, Elizabeth Hausler: “It gives me a lot of hope because the central government is really trying to enforce building codes”. Read more. “Volunteerism stands strong one year later – and has even won support from local authorities normally wary of grass-roots movements.” Read here. Build Change’s post-earthquake housing reconstruction program is featured on All Things Considered’s coverage of the first anniversary of the devastating earthquake in Sichuan, China. Read and listen here. January 2009. Features Build Change Founder, Dr. Elizabeth Hausler, after receiving the Equality Category Cash Prize at the 2008 Tech Awards. November 12, 2008. At the 2008 Tech Awards for Technology Benefiting Humanity, Build Change won the Katherine M. Swanson Equality Category Cash Prize. March 10, 2006. Build Change’s Founder, Dr. Elizabeth Hausler, is honored as Person of the Week on abcNEWS World News Tonight. Watch the video here. January 2005. Build Change’s Founder, Dr. Elizabeth Hausler, was interviewed by Echoing Green after the tsunami that struck Indonesia in December 2004. December 2016. Build Change Announces Aceh Earthquake Recovery Project. November 2016. Build Change Showcases Drone Mapping Project for Reconstruction in Nepal at Autodesk University. October 2016. Build Change Partners with Lloyd’s Charitable Trust on Disaster Prevention in Colombia and the Philippines. August 21, 2013. Build Change Selected as a Semi-Finalist for the 2013 Buckminster Fuller Challenge. April 23, 2013. Build Change offers a sustainable solution to reduce disaster. January 14, 2013. Build Change Completes Permanent Housing for 97 Families in Haiti With Partner J/P HRO. December 6, 2012. Build Change Primer on Post-Disaster Housing Reconstruction Approved by USAID. November 13, 2012. Build Change Seeks Support as It Prepares to Help Earthquake Survivors Rebuild in Myanmar. June 6, 2012. Build Change announced as finalist for prestigious World Habitat Awards. August 30, 2011. Dr. Hausler is awarded the 2011 US Social Entrepreneur of the Year Award by the Schwab Foundation. May 10, 2011. Dr. Hausler is awarded the 2011 $100,000 Lemelson-MIT Sustainability Award in recognition of the Build Change model. July 2009. Square and Circle Club Awards Grant to Build Change for Sichuan Earthquake Rebuilding. April 22, 2009. Build Change Expands Homeowner Training and Construction Supervision in Sichuan, China. At the request of the Tumen party secretary, Build Change is scaling up to train homeowners and supervise construction throughout Tumen Township in earthquake-hit Mianzhu. September 2008. Build Change Named 2008 Tech Awards Laureate by the San Jose Tech Museum of Innovation. Read the press release. March 2006. Draper Richards Foundation awards a 3-Year Grant to Build Change. Read the press release. May 2004. Echoing Green announces 2004 Fellowship. See the press release. March 2017 Build Change Wins 2017 Skoll Award! November 2014 Support us with a quick vote! April 2014 We Did It! March 2014 We’re almost there. We need your help to reach our $5,000 goal by MIDNIGHT TONIGHT (EST)! March 2014 We’re halfway there! Please help us reach the $5,000 we need to train Cekal Village to build earthquake-safe homes! March 2014 This March, please help us ensure that homes in Cekal Village, Indonesia, are safe during earthquakes. December 2013 Thank You for a Great Year! December 2013 Whose life will you change today? December 2013 Looking for a chance to give back after Black Friday and Cyber Monday? November 2013 Build Change created over 5,100 Jobs in Haiti! September 2013 Stop the Cycle: Help Families in Aceh Rebuild Safely, Permanently. April 2013 Earthquakes are inevitable. Disasters don’t have to be. March 2013 Celebrate Women in Construction! International Women’s Day is March 8, 2013. Learn about how Build Change is focusing on the vital role women play in the construction industry to celebrate this day. Click here to read the flyer in Bahasa. January 2013 Build Change Indonesia Newsletter. Learn about Build Change’s recent projects and activities in Indonesia, including the Grand Opening of our new office in Bandung. December 2012 Give a gift that makes a big difference!